Here it is October 24. The windows are open. I have to sleep with a fan because of the heat and humidity. I still have robust bunches of basil. I can’t EAT all the darned green peppers that are growing. And the tomatoes keep going and going and going. Do you suppose this can possibly last through to November 1? It has been a strange, strange fall–and not just the weather. Many changes in many strange ways. I am thankful that I have had the time, finally, to slow down, take stock, reevaluate and just attend to the home fires–and my mental health–for a while. If you’re in a baking frame of mind, try this Double Chocolate Bundt Cake with Ganache Glaze. I first read about this cake a couple of days ago on Cream Puffs in Venice. Since we had just finished our Italian Creme Cake, this was like a sign from God that I should make this fabulous chocolate cake this morning. I also made homemade bread using the whey from my hard cheese making efforts. The Cheese Queen was right. Substituting the whey for the water makes a fabulously flavorful difference in the bread. Of course, based on the comments to my cheese making experiments, none of you will actually HAVE any whey to be baking with since no one else seems interested in making cheese–just in eating it. I suppose I must have some sort of recessive peasant gene that makes me want to do things like make cheese, raise chickens and weave. Oh, and did I tell you my handyman, Walter, is installing a new outdoor clothes line for me? I can hardly WAIT to do laundry tomorrow! I’ll post photos! I have to admit that home cheese making feels a bit like conducting a chemistry experiment in my kitchen. I mean, with bread baking, I can FEEL the dough. There is some effort behind the whole affair of mixing flour, water, yeast and other ingredients, watching it rise, kneading and watching it rise again before shaping it with your hands into a final, glorious loaf. With home cheese making, you do quite a lot of waiting about. You mix in special ingredients that you must special order. Everything must be kept immaculately clean and sanitary. 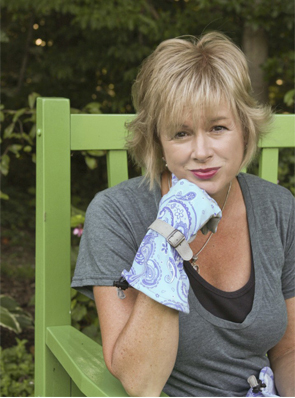 The guru of cheese making, Ricki Carroll, even recommends keeping meticulous notes in a cheese making journal. Nevertheless, the results of home cheese making can’t be denied. This salad LOOKS like art, doesn’t it? 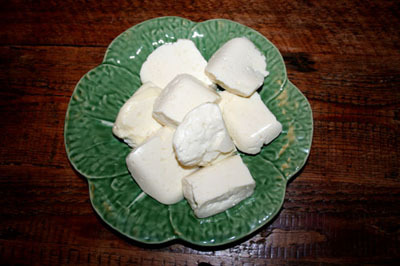 The recipe is from, of course, Home Cheese Making, by Ricki Carroll. 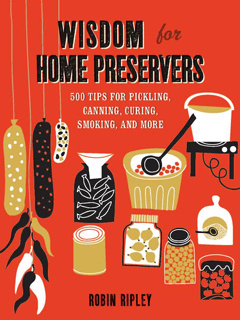 I have been slowly working my way through the book, starting with the soft, spreadable cheeses. Now that my fancy cheese press has arrived, I am venturing into the hard cheeses. 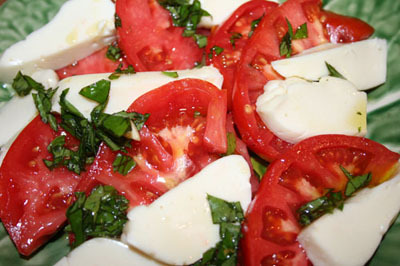 You can’t really count this 30 Minute Mozzarella as a hard cheese. And frankly, it’s a lot less work than even the soft cheeses. In fact, it’s ridiculously easy. 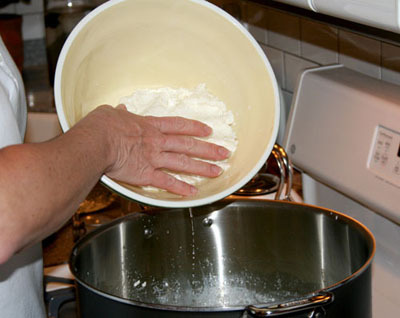 If you are even a little bit interested in cheese making, then place an order with the New England Cheesemaking Supply Company and give this recipe a whirl. I highly recommend that you buy the book because the introductory information is quite important, particularly information about sanitation, ingredients and heating of the milk. Look how easy the whole process was. I used the recipe from Ricki Carroll’s Home Cheese Making. I added the citric acid/water solution to the milk when it was at 55 degrees and mixed it thoroughly but gently. I slowly heated the milk on the stove to 88 degrees. (It helps that I have a gas stove, I think, because it gives me a great deal of immediate control over heat.) I gently added the diluted rennet and mixed again and then heated the milk to 100 degrees. 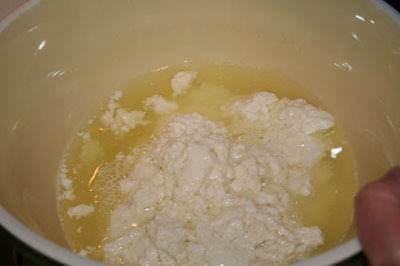 I microwaved the curds on high for 1 minute and again drained off all the excess whey. To distribute the heat evenly, I gently folded the cheese over and over like I was kneading bread. I microwaved the cheese twice again for 35 seconds each, kneading after each turn. Then I added the salt, kneading it to incorporate it into the cheese. 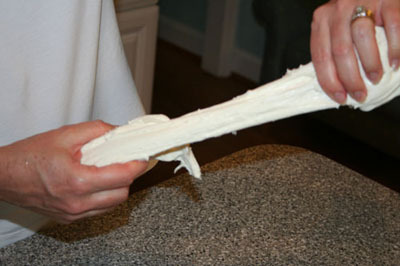 The recipe says cheese won’t stretch properly until it’s almost too hot to handle. I found it very hot, but if I moved quickly, it didn’t feel like it was burning at all. 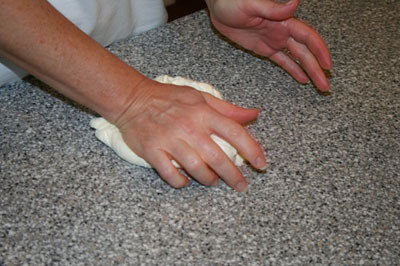 I kneaded until the cheese was smooth and elastic. It became nice and stretchy. I rolled the cheese into small balls and placed them into the frig to cool. The directions say to put them into a bowl of cold/ice water to bring down the heat if you don’t plan to eat them warm, but I forgot that part. Nevertheless, they were just dandy about 30 minutes later when I made the salad. What do you think? Does this look like art? Craft? Chemistry experiment? Would you give it a try?